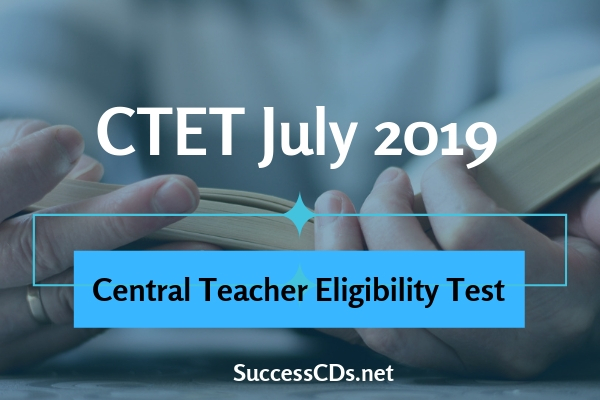 CTET 2019 Notification (July) - The Central Board of Secondary Education (CBSE) Delhi invites online application from the aspiring candidates to appear in the Central Teacher Eligibility Test (CTET) 2019 for July Session. CBSE will be conducting the 12th Edition of Central Teacher Eligibility Test (CTET) for a candidate to be eligible for appointment as a teacher for classes I to VIII. The test will be conducted in twenty languages all over the country. The CTET shall apply to schools of the Central Government (KVS, NVS, Tibetan Schools, etc) and schools under the Administrative Control of UT of Chandigarh, Andaman & Nicobar Islands, Lakshadweep, Daman & Diu, Dadra & Nagar Haveli and NCT of Delhi. Schools owned and managed by the State Govt. /local bodies and aided schools shall consider the TET conducted by the State Govt. However, a State Govt. can also consider the CTET if it decides not to conduct the State TET. According to CBSE Affiliation Bye-Law 53, prescribing the minimum qualifications for teachers to teach various subjects in Classes I to VIII in the schools Affiliated to CBSE stands amended to that extent and it shall be mandatory that the teachers appointed hereinafter i.e. 06th March 2013 to teach classes I to VIII in the Schools affiliated to the CBSE shall qualify/pass the Central Teacher Eligibility Test conducted by CBSE on behalf of Central Govt. or Teacher Eligibility Test (TET), conducted by the appropriate State Government in accordance with the Guidelines framed by the NCTE for this purpose. Further detailed information is available in Information Bulletin on our CTET website www.ctet.nic.in. Examination fee for Central Teacher Eligibility Test. y Online-mode (Payment by Debit Card / Credit Card). “Graduation with at least 50% marks and Bachelor of Education (B.Ed)” “(a) who has acquired the qualification or Bachelor of Education from any NCTE recognized institution shall be considered for appointment as a teacher in classes I to V provided the person so appointed as a teacher shall mandatorily undergo a six month Bridge Course in Elementary Education recognized by the NCTE, within two year of such appointment as primary teacher”. Senior Secondary (or its equivalent) with at least 50% marks and passed or appearing in final year of 4-year B.A./B.Sc. Ed or B.A.-Ed/B.Sc.Ed; or Graduation with at least 50% marks and passed or appearing in 1-year B.Ed (Special Education). Candidates who are appearing in the final year of bachelor degree in education or Diploma in Elementary Education etc are provisionally admitted and their CTET certificate shall be valid only on passing the aforesaid examinations. The candidate not having any of the above qualification shall not be eligible for appearing in Central Teacher Eligibility Test. The candidate should satisfy his/her eligibility before applying and shall be personally responsible in case he/she is not eligible to apply as per the given eligibility criteria. Relaxation up to 5% in the qualifying marks in the minimum Educational Qualification for eligibility shall be allowed to the candidates belonging to reserved categories, such as SC/ST/OBC/ Differently abled. Diploma/Degree Course in Teacher Education: For the purposes of this Notification, a Diploma/ Degree course in teacher education recognized by the NCTE only shall be considered. However, in case of Diploma in Education (Special Education) and B.ED. (Special Education), a course recognized by the Rehabilitation Council of India (RCI) only shall be considered. Training to be Undergone: A person with D.Ed. (Special Education) or qualification shall undergo, after appointment an NCTE recognized 6-month Special Program In Elementary Education. A person who is pursuing any of the teacher education courses (recognized by the NCTE or the RCI, as the case may be) specified in the NCTE. List of Examination cities where the CTET will be conducted is given in Appendix-III. Candidates are required to give three different options in order of their preference. For detailed information, please visit CTET website www.ctet.nic.in. While every effort will be made to allot a Centre in one of the places opted by the candidate, the Board reserves its discretion to allot a Centre other than that of Candidate’s choice anywhere in India. The candidates may download Admit Card from CTET official website only and appear for the exam at the given Centre. In case of any discrepancy noticed in admit card regarding particulars of candidate, photograph and signature or any other information vary from confirmation page, he/she may immediately contact CTET unit for necessary corrections. In case confirmation page is not generated after depositing the requisite fees, the candidate should approach the Assistant Secretary (Exam. ), CTET Unit, CBSE between 10:00 A.M. to 05:00 P.M along with proof of payment of fee i.e. candidate copy of E-Challan, if payment made through E-Challan or copy of bank statement, if payment made through Credit/Debit Card for considering his/her candidature for CTET - 2019 exam. In case confirmation page is not generated after depositing the requisite fees, the candidate should approach the Joint Secretary (CTET), CTET Unit, CBSE between 10:00 A.M. to 5:00 P.M. from 14th March to 20th March 2019 along with proof of payment of fee i.e. candidate copy of E-Challan, if payment made through E-Challan for considering his/her candidature for CTET - JULY-2019 exam.